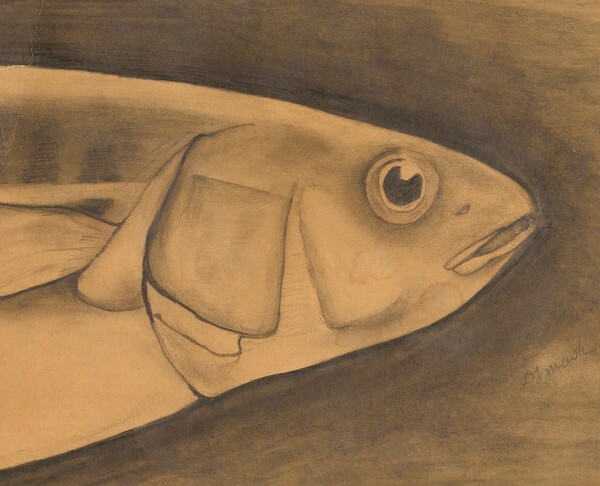 Artist Reply: I was 22 years old when I did this fish drawing. It was done with turpentine and and a #2 pencil. I can't stand that smell and I'll never do it again. For some reason the female teacher I had was very big on rubbing/mixing turpentine with graphite. That was 35 years ago this month. Artist Reply: This was done over 30 years ago. I saved it with some old photos. It was brittle. I remember giving to my mother and it must of got mixed with these old photos after she died. I remember doing it for a drawing course I was taking after school during my first teaching job in Pennsylvania in 1975.